E steker elektro-smog ta mehorá e olanan di resonansia korporal. E olanan akí ta ser usá pa nos organismo pa interkambio di informashon entre e sèlnan. Partikularmente peligroso ta e storengnan na alkanse di e frekuensia di resonansia propio, ku kada kurpa físiko ta poseé. Dor di aplikashon di e steker elektro-smog di EM, e balornan inmunológiko negativo, di por ehèmpel un selular, ta keda konvertí den balornan inmunológiko positivo. E steker tin e kalidat tambe di neutralisá e peliger di fèltnan elektromagnétiko. Pega un steker riba e selular kaminda tin kontakto ku kurpa. Riba pantaya di televishon, kòmpiuter, ipod, ipad, mikro-onda. No pegé dirèkt riba e antène, pa no stroba e resepshon. We suspect that the electromagnetic radiation from cell phones, computers, televisions, radios, microwave ovens, etc. has a negative effect on the body’s own resonance wave. This resonance waves are used by our body for the exchange of information between the cells. Such devices surround us everywhere and we even wear them constantly close to our bodies. It is therefore not surprising that a continued failure of this cell communication can also cause cancer. Particularly dangerous are the faults within the range of the resonance frequency, which any physical body has. 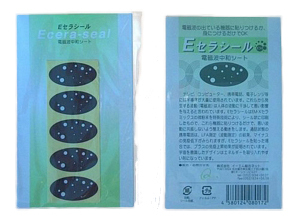 Through the application of EM-X ESMOG C-seal stickers, the very negative immune values, for example, of a GSM in operation, can be converted to positive values. The sticker also has the property to neutralize the danger of electromagnetic fields.